Rooted Practice: A Look into the Magical, Mystical World of... Spreadsheets! A Look into the Magical, Mystical World of... Spreadsheets! I've had a hard time writing a blog post today to follow up on yesterday's heavy hitter. If you're reading this, you probably know me personally... and you probably know that I love post-its and clipboards and (most especially) plastic page protectors. But I capital L-O-V-E, pink-puffy-heart, better than sliced bread, loooooove GoogleDocs. GoogleDocs is useful at work because multiple people can collaborate on the same document at the same time. It also allows me to edit the same document from work and from home without having to email it back and forth to myself or deal with a USB or lug my laptop around. 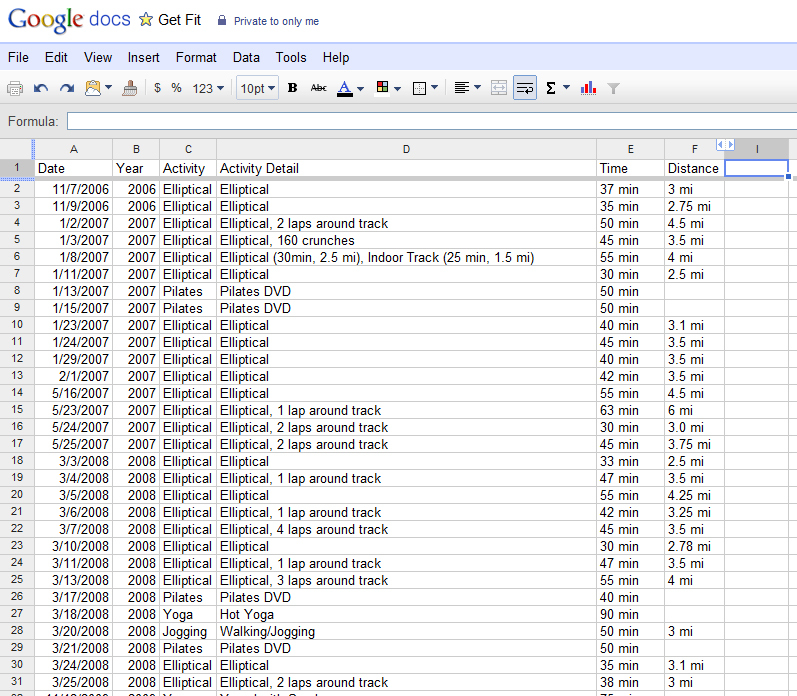 But the best thing is that GoogleDocs has been a great fitness motivator for me for the last few years. That's right, folks. I'm such a dweeb that I'm motivated by an Excel spreadsheet. It all started back in 2006 when I decided that I wanted to start getting more active and start working out. The gym at work has a bunch of ellipticals and an 1/8 mile indoor track (plus a 1/2 mile outdoor track.) 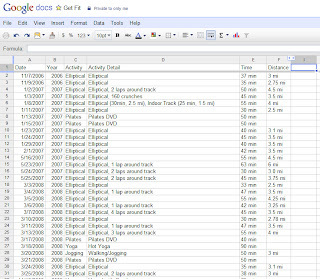 I started a GoogleDoc called "Get Fit" and documented my workouts. See those hidden columns? Sometimes I track my weight too. You don't get to see that. As an aside, you see that Hot Yoga class on 3/18/2008? That was my first yoga class EVER. I went to Hot Yoga with my friend Katie. No joke, I thought I was going to die. I was out of shape, it was HOT yoga, and on top of it there was a teacher trainee that kept pushing me into poses I wasn't ready for. Not cool. 4 years. 33 workouts. LAME. Then, as you all read yesterday, on November 12, 2009 I took my first yoga class. 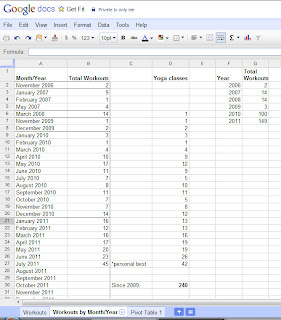 And once I started documenting in 2010, I realized around October or November that I could more than TRIPLE my previous 4 years and workout 100 times in 2010--so I did. But since I was still working out in fits and spurts, I decided that my goal for 2011 was to be more consistent--and I want to work out at least 10 times per month, every month. In June I realized that if I added a few extra classes and bike rides, I surpass my 2010 total in only 6 months. So I did. Recently, there have been some days where I have multiple workouts in a single day. I'm still trying to figure out how I want to count those--because I don't want to get in the habit of saying "well I did 2 yoga classes on 5 days, so that's my 10 workouts for the month." I think I need to go back and edit July to follow the format I used in June--but I'm too lazy to go back and get new screen shots right now. In case you're still reading this snoozefest of a post, there's one last thing that totally excited me--Google told me one day that I could create a pivot table! Pivot tables are a pretty new thing in my world, but I thought I'd try it out. Click to make it bigger. You know you want to. Everybody's doing it. It was glorious. SUPER easy to use--it tallies everything I need without me having to go back and create a bunch of "COUNTIF" codes. If you've stayed with me this long, I could use some help with my goals. 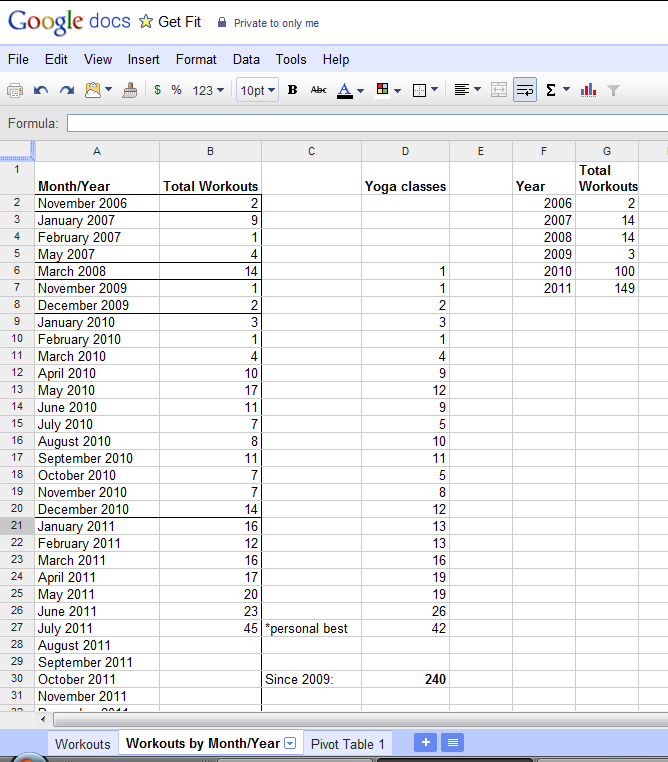 As I mentioned earlier, I set a long-term goal for the year of 10 workouts x 12 months. That one seems pretty inevitable at this point, so I started setting sub-goals for the year. In June it was to hit 100 workouts by the end of the month. Done! In July, when I realized that I'd be taking yoga classes every day for the first 2 1/2 weeks, I decided that I would do yoga every day for the month--and I'm on track to meet that goal. I'm having a hard time deciding what to do in August. August is complicated because I'll have two weeks of band camp from 1pm-9pm, and then I'll have teacher planning week. I might try to add some personal yoga practice in, or maybe some additional bike rides... but I'm not sold on anything yet. Do you have any yearly or monthly goals? How about any goal suggestions for me?